Crash Bandicoot N. Sane Trilogy Review - PlayStation 4 - Late To The Game — GamingWithSwag.com - Dads By Day, Gamers By Night. High Level Premise – 3D Platforming Trilogy Remastered for HD. Graphics/Style – Beautiful cartoonish sprites that are placed in levels with stunning backgrounds. Music/Soundtrack – Catchy Island tunes have been tweaked and remastered from the ground up. Story – You are Crash Bandicoot and you are involved in three adventures versus the evil Cortex. Replay-ability – Moderate - There are tons of goodies to collect in each level to keep you coming back for more. Time Commitment – To complete all three adventures, it would take around 14-18 hours. Single levels can be completed in less than 10 minutes, saving after each one. Value – High - There is a ton of content on this disc, and everything seems to be presented with a lot of polish. Favorite Element – All three original games remastered across the board in one place. I want to say that we had played a demo of the original Crash Bandicoot prior to release. Either way, my brother Sean purchased the original Crash Bandicoot when it was first released back on the original Sony PlayStation. I remember thinking that it was a neat take on platforming, the focus being on a level that primarily moves vertically in direction rather than horizontally. I had no idea what a "bandicoot" was, but needless to say we had a lot of fun with it. There was one vivid aspect of the game I do remember, the difficulty. As an avid video gamer, I had played my share of platforming games up until this point. Donkey Kong Country, Super Mario, Sonic, all had been in regular rotation in our consoles and I had already completed several of these by this time. However Crash Bandicoot can be one of the most maddening games ever due to reliance on depth perception for most levels combined with precise platforming skills needed to ace what would become a PlayStation staple for decades to come. 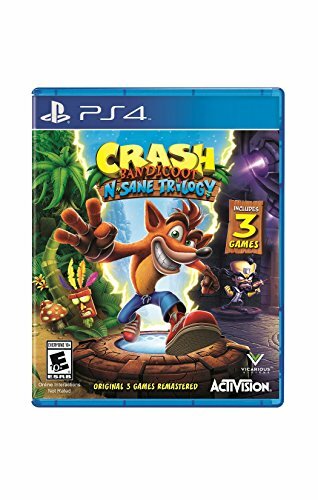 Crash Bandicoot N. Sane Trilogy has for the first time ever remastered Crash Bandicoot, Crash Bandicoot 2: Cortex Strikes Back, and Crash Bandicoot: Warped and presented them in one package. Gracefully redone from the ground up, the fans of Crash Bandicoot have been asking for these remasters for over a decade and finally to have them released in 2017 on PlayStation 4. I can say that this was not a lazy remaster and that time and care definitely went into making Mr. Bandicoot look the best as possible. Everything else seems spot on as well, including gameplay and the music being tweaked to perfection for a modern day release. I had a lot of fun with this trilogy back in the day and I am continuing to have a ton of fun with it now. My kids love the brightly colored levels and upbeat music, and are willing to play at any chance they get. I forgot how brutal the difficulty is, especially on the first game. However, with that being said we are still having a great time with Crash and his friends. At a retail price of $39.99, you are getting almost 40 hours of platforming content, which is unbelievable considering these retailed around $50 a piece when they were each first released. There also have been rumors that this will eventually make its way to the Xbox, PC, and Nintendo Switch Platforms. But for now, PlayStation 4 is the only outlet for this classic trilogy. Overall, this is a solid collection to add to your library and should definitely be checked out as soon as possible.